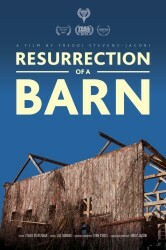 Indiana Barn Foundation and National Barn Alliance Coming Together July 18th to Talk Barn Preservation! Some of our biggest barn-loving fans are certainly aware of the great strides that the Indiana Barn Foundation (IBF) has made in its first two years, but the NBA couldn’t be more excited to travel to Indianapolis next month for the organization’s 2nd Annual Meeting and Conference at the Normandy Barn of the Indiana State Fairgrounds from 9am to 5pm on Saturday, July 18th. If you missed the NBA in Indianapolis for the 2013 National Trust for Historic Preservation Conference, now is your chance to become a member and buy some great barn-preservation merchandise to show your support for all those who #saveourbarns! The Indiana Barn Foundation, whose mission is to support the preservation of historic barns, has brought together a wide array of barn preservationists from across the Hoosier State and raised awareness about the value of Indiana’s historic barns in a number of ways, most notably with their lobbying support of tax relief legislation aimed at lessening the tax burden of property owners with historically significant barns! True to fashion, the NBA will also be holding our Annual Membership Meeting that weekend (details to follow via electronic communication to NBA members). A recent press release from IBF details: “From barn enthusiasts to experts, this one-day event will offer options for anyone who appreciates barns and wants to see them remain part of Indiana’s landscape. Barn owners can learn from a panel of contractors and preservation experts during a Question and Answer Session, and will hear about legislative efforts affecting barn owners. “The keynote speaker is architect Chuck Bultman, of Ann Arbor, Michigan. Bultman has adapted over 30 barns to new uses, including wedding venues and event spaces, and has restored barns ‘to just be barns’. Bultman is a board member of the NBA and member of several preservation organizations including the Timber Framers Guild. Attendees will also meet artists and crafters with a passion for artwork that features barns, including painter Gwen Gutwein, photographer Marsha Williamson-Mohr, and Indiana Artisan Dorrell Harris. Indiana Barn Foundation’s plans for a Bicentennial Barn Quilt will also be revealed. 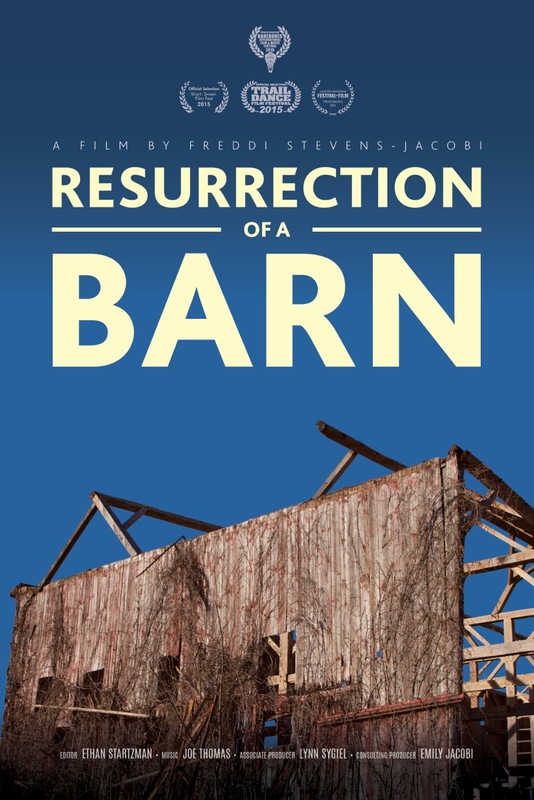 “Other highlights of the day will be a screening of “The Resurrection of a Barn” by IBF member and filmmaker Freddi Stevens-Jacobi, a catered lunch served family style and accompanied by live music, and a close-up look at how barns are constructed with the raising of a scale model wooden barn and also a computer-generated barn model. At 3 o’clock the conference will move to Zionsville, and conclude with a tour of the farm and historic barns of Traders Point Creamery. Registration cost for the entire day will include lunch and barn tour and will be just $40 per person ($30 for IBF or NBA members). Online registration is available on the Indiana Barn Foundation web site at www.indianabarns.org, under Events. Membership forms can also be found on the website. We hope you will join us in Indy! 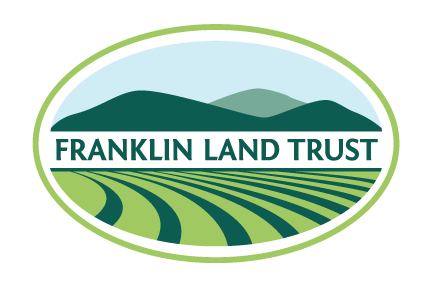 This month’s post comes to us from dedicated members of The Franklin Trust (FLT) out of western Massachusetts — “a non-profit organization that assists farmers and other landowners who want to protect their land from unwanted development.” The NBA is pleased to the growing interest in land conservation as it relates to saving resources of all sorts — including the historic built environment! The people of Plainfield and of Western Massachusetts are privileged to have had the historic 107-acre Guyette Farm donated to the Franklin Land Trust. Under the supervision of the FLT, this land will be forever protected from development and neglect. As a community leader in the protection of open land, the FLT is embarking on new ground with the recent acquisition of not just a beautiful piece of farmland, but also an entire farm complete with an antique barn. What is farmland without a farm or without a barn? Sometimes the proper stewardship of rural land involves the proper stewardship of the structures that defined that lands purpose in history. The Guyette farm is home to an early 19th century English barn, not an average barn, but one full of unique architectural features not commonly found all in a single structure: The 30×40 foot barn is made up of large hand-hewed timbers, intricate English joinery, a steep roof, a five sided ridge beam and robust wind bracing in the roof system. This group of distinctive features defines this building as an early example of a classic English hinterland barn: the singular landscape element that symbolizes early American life. Fortunately, for its age, this barn has survived with dignity: the core barn structure and even a small ell are in very good structural condition. The barn however is in jeopardy of structural failure and deterioration due to severe foundation issues. As is typical of structures built in the 1800’s, this barn, as strong as it is, was built on a rather poor stone foundation. Time and the cycling of the seasons have taken their toll on the stone structure supporting the barn and leave it struggling to stand straight. With foundation failure comes structural failure: something that is avoidable with proper and timely attention. The Guyette barn is facing a critical time; it is a valued part of the Plainfield countryside and recognizable by generations of locals. To the casual observer it is a pastoral symbol of rural history quietly growing old in the field, but closer inspections reveals problems that will lead to its rapid decline if not addressed in the near future. This fine example of our agricultural heritage has a lot to offer and is capable of serving many more generations with proper stewardship. The Guyette barn is a barn worth saving and a project the Franklin Land Trust is privileged to have the opportunity to venture into. This post comes to us from our Vice President, Jeffrey Marshall – a man that wears a number of hats! Marshall is also the current President of the Historic Barn and Farm Foundation of Pennsylvania and President of the Heritage Conservancy, a non-profit organization that advocates for saving much of Bucks County, PA’s historic and natural resources. This post highlights Jeff’s latest work to gather lovers of historic barns and timber-framing construction together to marvel at some of the nation’s earliest surviving agricultural buildings. We sure hope you can join in the fun! 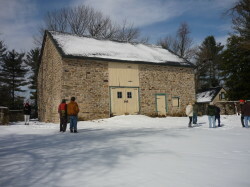 This image of the Paxon Road Barn – one of great barns featured during this TTRAG conference – was taken during NBA’s 2015 Winter Meeting. We showed Winter! 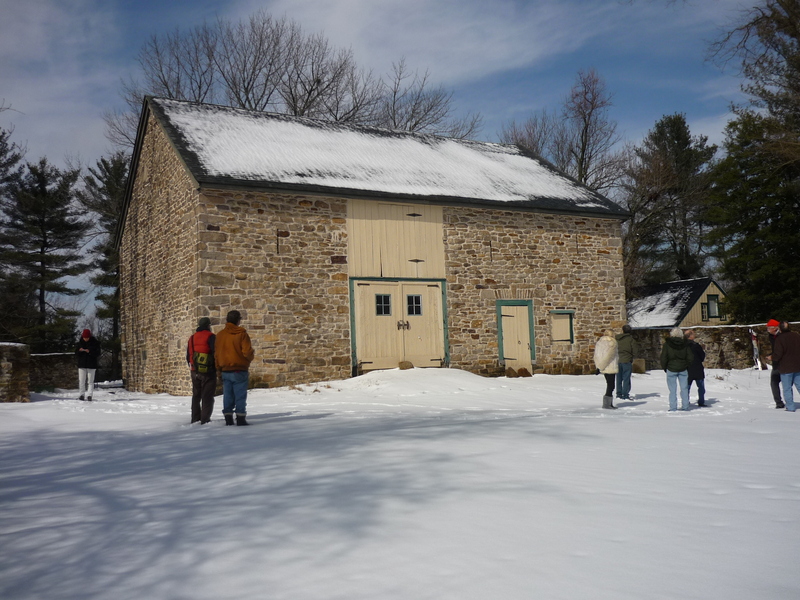 For those who missed the NBA Winter meeting held in the snow last month,barn and vernacular architecture enthusiasts can now register for a tour which is being presented as part of the 2015 Traditional Timberframe Research and Advisory Group (TTRAG) symposium on April 18, Lahaska, Bucks County, PA. The cost for the tour only (the symposium is full) is $65 per person, including lunch. The tour itinerary includes two outstanding Pennsylvania Standard barns on Mechanicsville Road Barn and Tinicum Park Barn, the 18th century English Paxson Road Barn, and theWindy Bush Road double-decker barn. As an additional bonus, the 19th century Stover-Myers Mill with all of its intact mill works will be open. You can register for the tour online http://www.tfguild.org/about/traditional-timberframe-research-and-advisory-group or call Sue Warden at the Guild office, 855/598-1803. 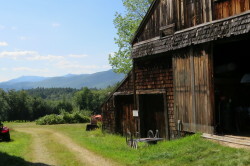 Long-time NBA member, Mona Hennes has put extraordinary energy and effort into researching this beautiful and unique barn that holds a special place in her family history. And the publication she has put together is testament to her diligence! Mona was kind enough to share her masterpiece with us and allow the NBA to reprint a portion of it here. A larger and more detailed article will be featured in the upcoming issue of our printed newsletter, The Barn Door. Mona is very interested in this barn type and its construction methods, and is eager to identify others like it. If you know of a similar barn elsewhere in the country, please post a comment below to help her learn more! In 1850, the seven member John Squire Family were among thousands of immigrants who came to the United States in search of a better life. The ship manifest lists Frederick Squire at age 3 when he traveled to America. Frederick grew up in Iowa and Indiana and married Frances E. Dean in 1866. Like hundreds of others, the young couple bravely carved out land as homesteaders in Lulu Township, Mitchell County, Kansas in 1870. Frederick and Frances Squire fulfilled their homestead requirements including building a house, digging a well, plowing, planting crops and living off the land. In the end, they raised a family and became respected Mitchell County land owners who were responsible for the construction of a most remarkable barn in the fall of 1888. 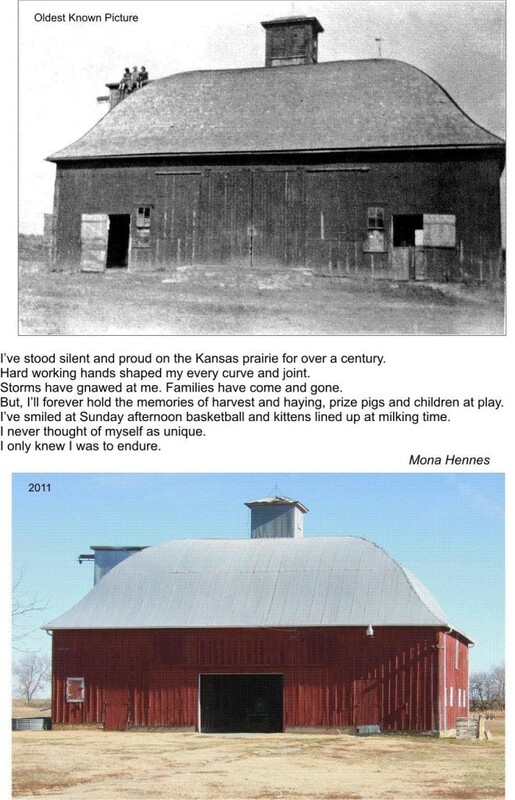 Images of the Squire-Hennes Barn, Courtesy of Mona Hennes. Author’s permission required for reprinting or re-use of this material. Mr. Squire’s barn was 40′ by 58′ by 32′ high and built by Hamilton Lee Wiley, a contractor from Beloit, who partnered briefly with a carpenter named Eli Pfrimmer Newbanks. A second generation American of French descent, Newbanks grew up in Corydon, Indiana, and came to Mitchell County, Kansas, with his wife’s family as a homesteader around 1871. He was well educated in carpentry and architecture. During his career, Newbanks worked on large construction projects including The Alpine Tunnel built for the D&RG Narrow Gauge railroad in Gunnison, Colorado. He also worked on projects in Louisiana, Texas and Missouri. For a short time (~1882 to 1886), after the untimely death of his wife Delilah, Eli Newbanks partnered with Hamilton Wiley in his Beloit Contracting Business. Their advertisement appeared weekly in the Beloit Gazette. In 1884, Eli became the lead carpenter for an octagon barn, built in Scottsville KS, just nine miles north and east of the Squire-Hennes barn. This barn, built for C. W. Culp, owner of Eureka Stock Farm, was the pinnacle of local construction jobs. While the barn no longer exists, it had the same ogee roof design as the Squire-Hennes barn. Winning this contract was a huge plus for Hamilton Wiley’s business reputation. One year later, 1888, Hamilton Lee Wiley built the Squire-Hennes barn for Frederick F. Squire. In 1893, twenty three years after he homesteaded his farm in Lulu Township, Frederick Squire moved to Beloit and left his 600+ acres of property to be farmed by others. He died suddenly of appendicitis in January of 1899 and was buried in Elmwood Cemetery in Beloit. His properties were divided among his children, with the home farm passing to his son, John. When John Squire left Kansas around 1915, he rented the Squire farm to Caspar Hennes, my grandfather, who was living just one mile west. Caspar Hennes (Grandfather), Fred Hennes (Dad,) and John Hennes (Uncle) farmed the property for the Squire family until ~1928, when Fred and John Hennes purchased some of the land, the farm house and buildings. My Dad bought out the interest of his brother, John Hennes, around 1943. My brother Jim Hennes farmed the land and cared for the barn until the mid-1970s. He tinned the barn’s roof which probably preserved the structure. My nephew, Mark Hennes, still farms land for the Records family. Howard Records, who lives in Arizona, is the great grandson of Dr. Thomas E. Records, husband of eldest daughter Lora E. Squire. 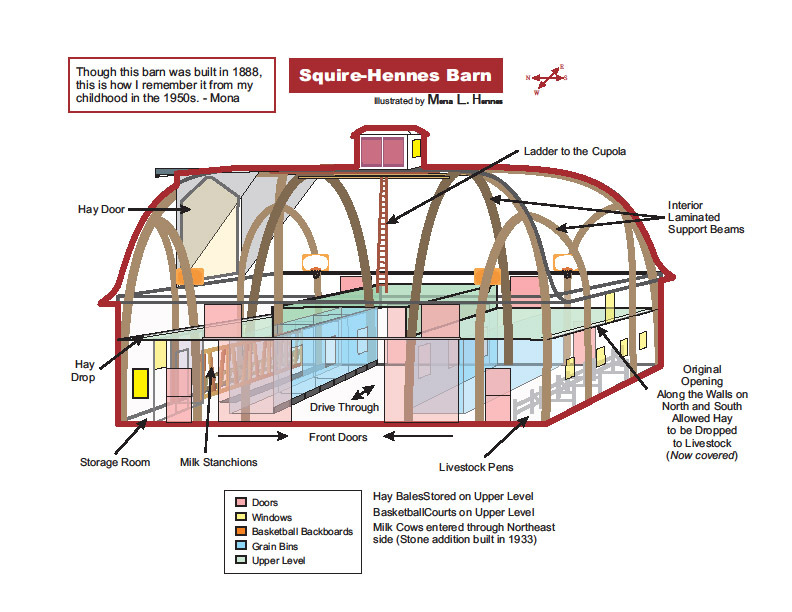 Mona Hennes’ Plan and Depiction of the Barn’s Interior. Author’s permission required for any re-printing or re-use of this image. NBA Goes on the Road to Savannah, GA! Here we go again! NBA Board Members and state barn organization partners are volunteering their time and energy to continue the NBA’s presence at the National Trust for Historic Preservation’s annual conference. 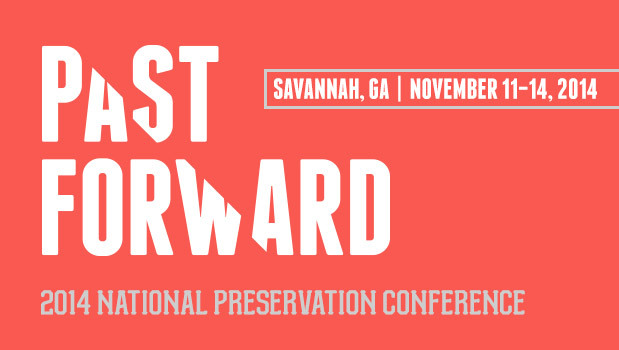 This year, the action is in Savannah, Georgia, where we connect with preservationists of all kinds to engage them in conversations about saving America’s historic barns! 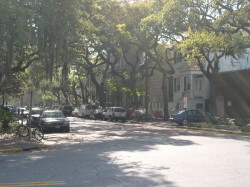 What does an urban landscape like Savannah have to offer barn lovers? We think the trip to the South has a lot of potential! The state of Georgia was one of the first to create an historic agricultural context to aid in the evaluation of farm properties for the National Register of Historic Places (NRHP). Anyone can download a copy of this context, entitled Tilling the Earth, and learn more about the types of agriculture practiced historically in the state. Vernacular agricultural studies are also common about students at the Savannah College of Design (SCAD), one of the NTHP’s local partners in conference activities. Though we won’t be able to bring any of our barn models south this year, we will bring our fabulous 2014 t-shirts with the catchy phrase: “Vernacular is Spectacular: Save Our Barns!” After the conference, these t-shirts will be up for sale to great friends like you – they are sure to make great stocking stuffers for any barn lover! Until then, plan to swing by our booth if you’re attending the NTHP conference and check out our hats, t-shirts, bumper stickers, and other helpful barn-preservation items to show your support for old barns! Help NBA get the Barn Question back in the Ag Census! Posted by danae on Sep 10, 2014 in Ag Census, Barn Preservation, The Barn Journal | Comments Off on Help NBA get the Barn Question back in the Ag Census! The National Agricultural Statistics Service (NASS) is soliciting suggestions for changes to the Census of Agriculture. All submissions are time sensitive and must be received no later than September 30, 2014. Please help the NBA by lobbying the USDA using the following link to their public comment form! Each Comment Form asks for a name, address, email address and your affiliation. Please feel free to note an affiliation with the National Barn Alliance to show your support for historic barns! What new or additional information is needed? For the first time in the history of the Census, the 2007 Census of Agriculture counted farms that had a barn 50 years or older. Unfortunately the 2012 Census of Agriculture did not have the barn question in it. We are advocating for the re-introduction of the question in the 2017 Census so that we can continue to monitor the numbers of farms that have an old barn on them and compare the new data to the 2007 Census. Please put the “Barn Question” back into the 2017 Census of Agriculture. Why is the information needed? Our nation’s old historic barns are an important and irreplaceable historic resources on our landscape. We need to know how many there are and then determine their condition in order to develop programs to support their rehabilitation and re-use. In order to know how many there are, we need to count them. 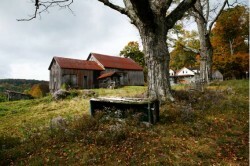 The USDA can and should be a part of this process of documenting the old barns on farms. 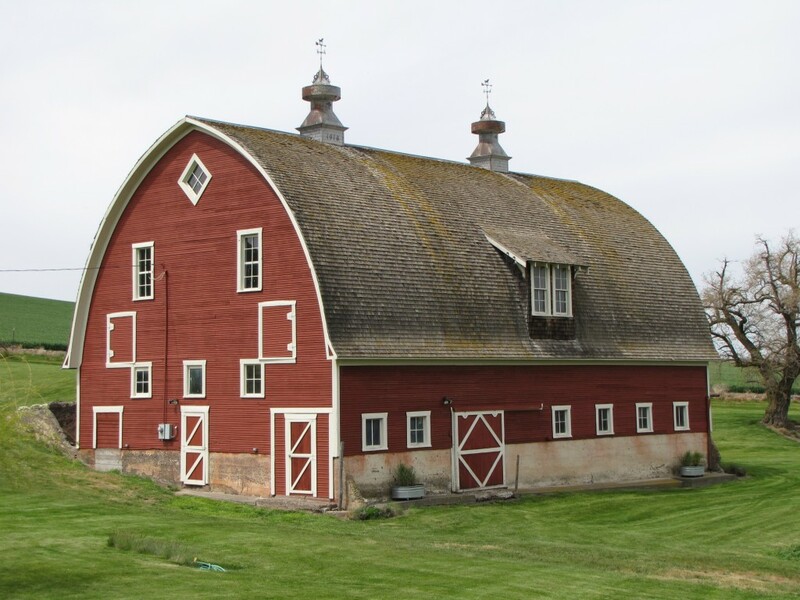 We believe that it is important to bring back the same question found on the 2007 Census of Agriculture and count the number of farms that have a barn 50 years or older across the USA. Fifty years is the threshold of age for beginning to consider a building’s historical contributions to the past according to federal standards established by the National Historic Preservation Act of 1966, as amended. Consider that at the height of family farms in America, over 26 million farms dotted the American landscape. Most had at least one historic barn. By the 2007 Census of Agriculture we had around 2 million farms and many did not have an old barn on them. The 2007 Census of Agriculture counted just over 650,000 farms with at least one older barn on it. The data was invaluable! At the national and state levels and on all questionnaires the USDA disseminates. The American public, the National Barn Alliance, the 50 State Historic Preservation Offices, countless non-profit preservation organizations (statewide, regional, county, and local preservation advocacy organizations as well as barn preservation organizations, farmland, and rural conservation organizations across the country). And don’t forget about future researchers interested in America’s agricultural past! 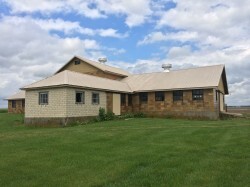 This guest post by Raina Regan, a preservationist working hard to bring attention to barn preservation at Indiana Landmarks, the statewide “nonprofit organization, fighting to defend architecturally unique, historically significant, and communally cherished properties…” in Indiana. NBA is thrilled to see the dedication of those barn-loving Hoosiers! This Barn Again! workshop is not a new thing for Indiana Landmarks and they sure know how to do it right – don’t miss out on this great event. Although located directly east of metropolitan Indianapolis, Hancock County, Indiana is rich in agricultural heritage. Driving county roads, you’ll find timber frame barns and steel silos dotting the slightly rolling landscape. This fall, don’t miss Indiana Landmarks’ BARN AGAIN! workshop in Hancock County to explore this historic community while learning about barn preservation. This day long workshop on September 19 will provide practical solutions from experts on how to maintain, rehabilitate, and adapt old barns for today’s needs. Participants will learn about the history and technology of barns as well as barn maintenance, adaptive reuse, and preservation. Rick Collins of Trillium Dell Timberworks will headline our workshop speakers. The workshop will also highlight a new Indiana law which offers a 100 percent property tax deduction for heritage barns not used for farming or business purposes. The afternoon will include a tour of four barns in northern Hancock County, providing an opportunity to learn about the design, history, and rehabilitation of historic barns. The tour includes a stop at the award-winning, National Register-listed Frank Littleton Round Barn. The Littleton Round Barn dates from 1903 and is an impressive true circular barn with a 102’ diameter. The barn was commissioned by Indianapolis attorney Frank Littleton, who called upon Benton Steele for the design. 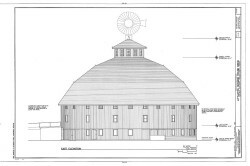 Steele had recently built the largest round barn in the state, a 100’ diameter round barn for Littleton’s rival, Congressman Wymond L. Beckett. As the story is told, Littleton had Steele build his barn just a little bit larger, for a total of 102 feet in diameter, so that he could beat out his rival. Constructed by Issac McNamee and Horace Duncan, the Littleton Round Barn still holds the title for largest round barn in the state of Indiana. We’re excited to include the property on our barn tour to highlight this impressive structure which continues to function in an agricultural use. 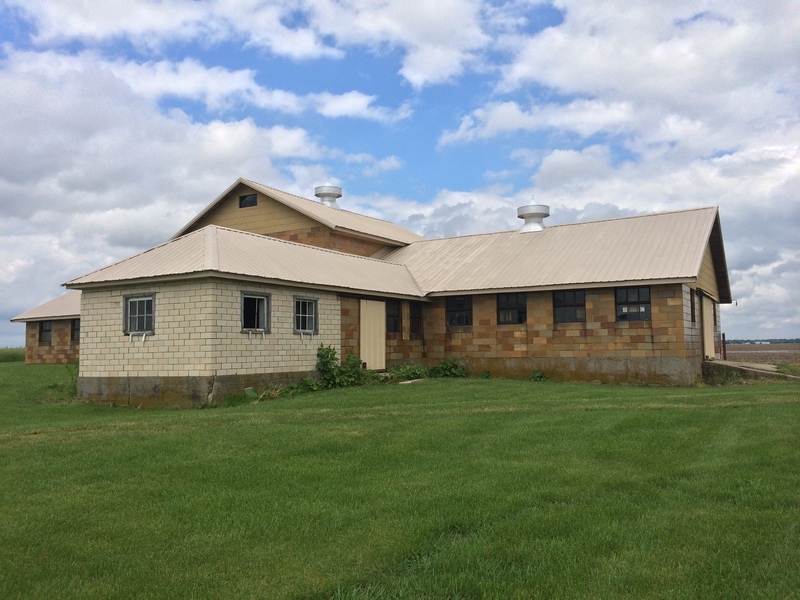 Other barns on the tour include a depression-era Dairy Barn and an unusual transverse frame basement barn – featuring rusticated concrete blocks cast on site. Our fourth barn is a 19th century timber frame barn, which sits on an early Hancock County farm dating from the 1830s. The tour promises to highlight a wide variety of historic barn types, perfect for anyone passionate about agricultural heritage. The BARN AGAIN! workshop will be held at NineStar Connect Conference Center, 2243 East Main Street, Greenfield, IN 46140. Cost for the day-long workshop is $45 and includes lectures, lunch, an informational packet, and the barn tour. There is a discounted price for members of Indiana Landmarks. The reservation deadline for the BARN AGAIN! workshop is September 15. Register online at barnagain2014.eventbrite.com or contact Indiana Landmarks at 800-450-4534. Questions? Contact Raina Regan, Community Preservation Specialist, 317-639-4534, rregan@indianalandmarks.org. New Indiana Barn Foundation Hard at Work! A passionate and motivated group of Hooisers have been working hard to establish a barn organization for the state of Indiana in recent months – and what great success they have had in such a short period of time. The first annual meeting of the Indiana Barn Foundation is coming up on July 12th and the group can already boast of supporting barn preservation legislation! Last month, members of the organization were in Indianapolis to witness Governor Pence sign Bill 1046–a law that allows for a property tax deduction on historic barns in Indiana. 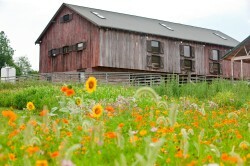 Way to go Hoosiers and congratulations to Indiana’s historic barns! We know great things are in store for this wonderful new barn preservation organization, and hope you will lend them your support in the effort. Below is a description of the group’s purpose and goals taken from their website. Please share this information with anyone you think would be interested and encourage them to attend the meeting on July 12th at the Indiana state fairgrounds! “Indiana Barn Foundation is being established to unite those of us who value the legacy of Hoosier farmers who have worked against the odds, often single–handedly and with no financial incentive, to maintain and preserve these landmarks. We see Indiana’s historic barns as being an asset to Indiana’s larger cultural heritage; an asset worth preserving by assisting our farmers who struggle to maintain them. Our Proposal: We are establishing, in conjunction with several other organizations, a private, nonprofit 501c3 mechanism to provide grants to rehab historic Indiana barns. We expect to operate efficiently under the umbrella of the Indiana Barn Foundation, while enlisting the expertise and resources of the Indiana Farm Bureau, Indiana Landmarks, the National Barn Alliance and many other groups who will join us in this work. To keep this work alive for future generations, we also foresee the Indiana Barn Foundation some day financing educational programs, producing workshops and educational materials, and surveying and documenting existing barns. It couldn’t be said any better; kudos from the NBA to the Indiana Barn Foundation! This guest post was uncovered by our Past President, Charles Leik, who has an knack for finding enchanting things about barns. It has been reprinted here by permission from the October 31, 2013 The Peoples Exchange, Shipshewana, IN and the author who lives on an nearby Indiana dairy farm. Thanks for sharing your article with the NBA, Amber! At home, I have a favorite place. Our big creaky, old barn. It has a mingling, musty, scent of aged wood, cows, grain, sweet alfalfa hay and scratchy old coiled rope. The barn isn’t too quiet, but it isn’t too loud, either. The barn swallows’ chirps, the young calves’ bawling, the little kittens’ meows, and the soft, whispering wind just outside join together in a perfect melody, and to me, the song of the outdoors is better than any choir or singing group anywhere. But, in addition, the barn has a nice, peaceful silence, one that is just right, and relaxing. The barn has plenty of space where you can just lay there for a while, just thinking, seeing and breathing in everything. It has lots of spider webs, and warm sunlight pours onto the dusty floor through the holes in the creaky ancient wooden walls. Sometimes I pack a little picnic lunch, and I’ll eat it in the haymow, sharing teeny bits of bread, or meat with the kittens that are sitting by my feet begging and they’ll start purring away like a little washing machine motor. Inside the barn, an enormous pile of fresh grain fills the air with a pungent scent, that waves through the air filling every little nook and cranny. Children can play in the big pile for hours at a time, having the time of their life all the while. When they try to race up it, the grain crumples under their feet like sand, and every step they try to take up, they slide two steps down. Then, on the way down, instead of bothering with the grain burying their feet with every step they take, they just flop down, and make their way down as if it was a slide. The barn is a masterpiece. There are very complicated patterns in the beams that are holding up the tall walls and high ceilings that are taller than a humongous old oak tree, like a puzzle, or a difficult crossword. The barn was built so long ago that there aren’t any nails in the gigantically tall, wooden beams and poles. Instead, there are wooden pegs in their place. In the barn, square bales of luscious green hay stand, piled all the way up to the high roof. They fill the air with a sweet scent. The bales are scratchy, and give you splinters if you climb them. The floorboards in the barn croak and moan, creak and groan under my feet as I walk across them. They are wooden and dusty and covered with wheat, and straw, and hay, and grain. Without them, I would not be able to go up into the hayloft. The planks are an important piece of the barn. In the barn, we have lots of scratchy, stale rope. In the “olden days” it was used to swing loose hay across the barn. Now, you can use it to swing yourself across the barn! You grab it, climb up a couple of straw bales, and jump. You swing way to the other side of the barn, then back again, on and on, until the big swing across the barn dwindles down to a little swing for a few feet. Then you jump off, and start all over again, until you get tired, and you think that you are done swinging for the day. The steel cow stanchions stand vacant, empty, spider webby, and dusty like an old abandoned lot. When you turn the old, almost antique latches, they click and then go “eeeeeee”. The metal is always cool to the touch, even in the middle of the hottest summer. The wooden calf stalls beside the stanchions are all full of young, bawling calves. The pens are stained with manure from calves of the past. Straw and sawdust, litter the cement floor, and the ground is dusty from the sawdust. In the barn, silky spider webs hang thick. They are sticky, heavy, tangles of strong, webby, stringy lines. If you walk into them, they stick to your face, and if you try to pull them off, they cling to your finger like super glue. Spider webs make the barn look cozy. In the barn the ceilings are tall. The filtered yellow plastic covering little of the roof lets in a few warm rays of summer. The rest of the roof is covered with aged rusty metal. When it rains, the drops leak through the many gaps and holes in the ceiling. Without the roof, the barn would be incomplete. On the outside of the barn, there is a big cement hill leading to the haymow. The old splintery, wooden handrails at the sides are all falling off. The cement is dirty, weathered, and covered with patches of grass, weeds, and manure. The hill is hollow in the middle where we park our dirty smelly old manure spreader. On the upper outside of the barn near the roof, there are white plastic letters that spell “THE OLD HOMESTEAD”. The letters are clean, and whenever one of them falls down or gets damaged, we replace them. They are the pride of the barn. The barn is nice and warm in the winter, and nice and cool in the summer. It blocks out the harsh winter winds, but lets in the summer breezes. The barn is absolutely huge, but not empty. The barn is a sleepy haven for the animals. It is musty, dirty, and almost ancient, but they don’t seem to care. They like the barn just the way it is, and so do I. On the outside, the old peeling red paint on the barn is just enough for you to feel like you have been inside it about a million times, and that you have known it all your life. The barn is already over a hundred years old, and still, the rough weathered, sturdy wood stoutly, stands tall. The barn is my most favorite place in the world. At home, I have a favorite place. Our big, creaky, old barn. 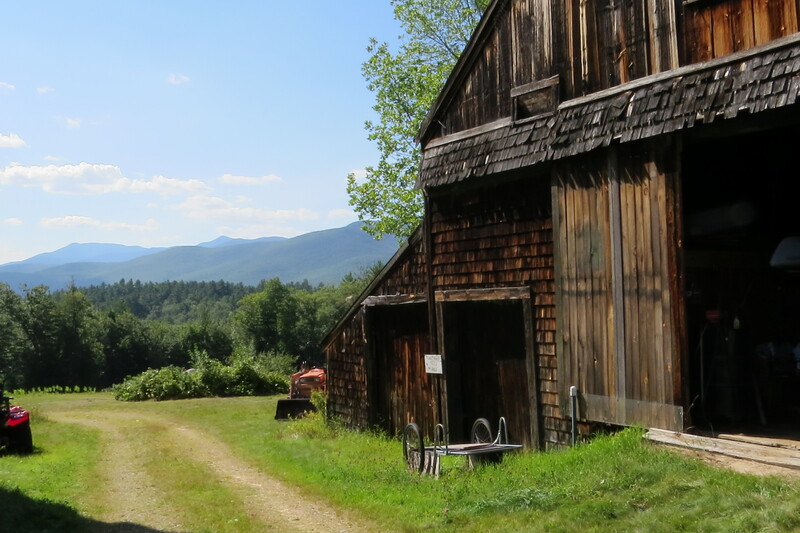 This post comes from our barn-loving friends in Madison, NH. This is the first year of their barn tour, but it will certainly not be their last! What a great event! 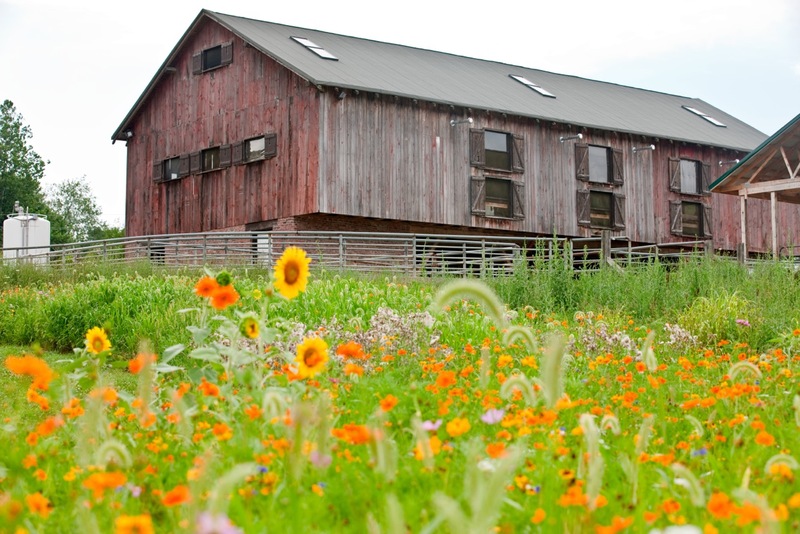 The Madison Historic Barn Tour weekend, July 11 & 12, 2014 is fast approaching. 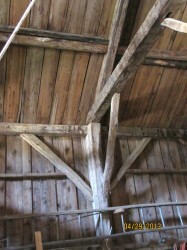 With seven wonderful old 18th and 19th century barns on the tour, including E.E. Cummings’ Joy Farm, interest is growing rapidly. The small Town of Madison is located in the beautiful Mount Washington Valley of New Hampshire. Incorporated in 1852, Madison has a long and interesting history as a farming and tourist community. Town tax records reveal that there are approximately 50 barns in Madison which are over 100 years old. The Friends of Madison Library (FOML), a 501(c)(3) non-profit supporting the local public library, has organized this weekend fundraiser (be sure to visit their website). 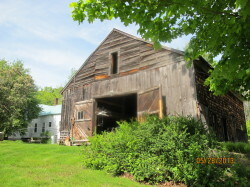 Barns on the tour, in addition to Joy Farm, include the Ambrose Barn built in the mid-1870s by then owner Henry Harriman with timbers from his neighbor’s barn. Nearby is the Old Public Burying Ground where several of Madison’s Revolutionary War soldiers are buried. The Gilman Barn built circa 1795 as a working farm has been in the Gilman family since then. Built with wooden pegs and resting on a loose field stone foundation, Alan Gilman’s barn is as “square” today as the day it was built. The large “Gilman Cemetery” across the street is the final resting place of generations of Madison residents, including the original owners of several of the Tour Barns. The Henry Harmon place c 1850 may have been built earlier at Madison Corner, then moved by oxen to the open meadows of Goe Hill. A painting of this barn by Andrew Haines was recently on display at the Boston Museum of Fine Arts. Come to Madison to see all seven tour barns. A list of the other forty plus Madison barns over 100 years old will be available for those who want to do more independent exploring. Directions to the numerous fascinating local cemeteries may lead you to find the resting places of former barn owners, or ancestors of your own. Pick up a copy of Mary Lucy’s book Cemeteries and Graveyards of Madison, NH from the Madison Historical Society. Browse the Barn themed Art Show, purchase barn note cards and photo sketches, or place a bid on a photo or professional work of art in oil or watercolor at our Silent Auction. Don’t miss barn historian Bob Cottrell’s talk and discussion of 18th and 19th century New England Barns on Friday night at the Madison Library. Bob has a Master’s Degree from the Winterthur Program in Early American Culture. He has worked in the history/museum field since 1980. Previously, Bob worked at the Smithsonian’s National Museum of American Art in Washington, D.C., the Crowley Museum and Nature Center in Sarasota, Florida, the St. Petersburg Historical Museum also in Florida, the Conner Prairie Museum in Indiana and at Bilkent University in Ankara, Turkey. In 1996 he became the founding Director of the Remick Country Doctor Museum and Farm in Tamworth, New Hampshire, another great place to visit while you are here. Bob’s talk is included in the price of the Barn Tour. At the southern end of the Mount Washington Valley, the village of Madison is just minutes away from numerous hotels, picturesque B&Bs, wonderful restaurants and the tranquility of our natural setting around Silver Lake. Make plans now to spend a day or two before or after the Barn Tour. Bring a blanket and buy a Barn Tour Bag Lunch to enjoy at one of our Town Beaches or in the garden at the Library. Tickets on the weekend of the Tour will be $20 per person. Advanced tickets may be purchased before July 1, 2014 for $15 per person, payable by check to Friends of Madison Library at PO Box 240, Madison, NH 03849.